Published May 1, 2014 at 768 × 1024 in Replacing the first of Dorothy’s floors. Congratulations on the beautiful progress, Tony… and thanks for the photo! It came up when I was researching images of old keel bolts and extraction videos last night. I have a keel bolt that looks, from the exposed end, very similar to that one. It’s the bolt that holds the aft (narrow wedge) end of the lead keel on PAX. It’s under the engine (of course) so it’s a pia to access and I’m pretty sure has not been replaced since she launched in 1936. 7 other keel bolts were replaced in the 1980s with stainless and I’ve just finished replacing them all with silicone bronze. 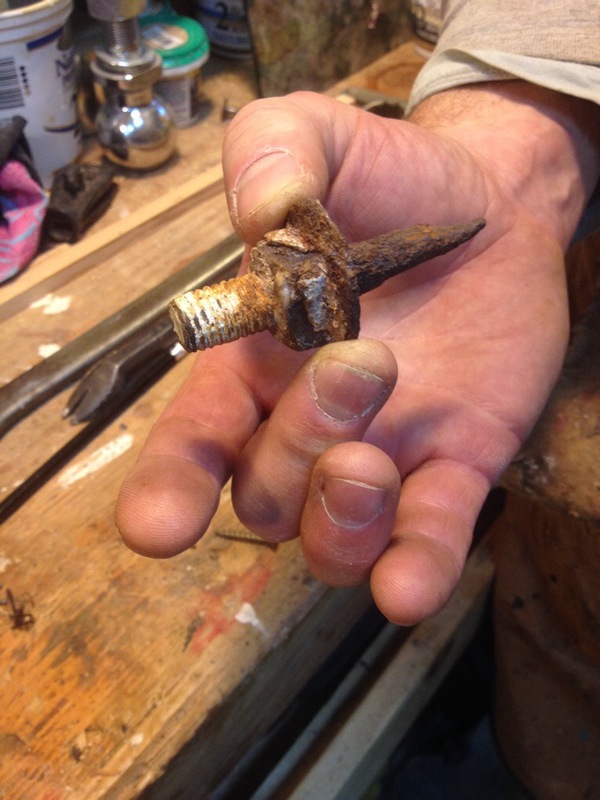 Les Schnick, a local boatwright, mentioned that “old” steel keel bolts sometimes disintegrate, except for the two far ends and that when you drive them out, they sometimes wedge. Now I see what he described! Curious how much of this bolt was left and how you got it out. Thanks for your inspiration and sage advice, friend! Look forward to seeing you at Wooden Boat Festival, if not before. Continued good luck and progress on the Dorothy! Touch wood.